Here is a perfect heifer. 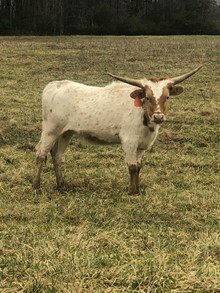 Her pedigree is stacked with great animals that are horn producers as well as show winners. “Karma”s sire, Mackenzie is now 80”. Karma’s dam is a (2 TIME!) World Champion All Age Female. She is gentle enough to have been successfully shown by our 3 year old daughter in haltered classes at numerous shows. Measured 45.5” on 2/22/2017. That predicts to 81.5” at maturity!